I can't believe the halfway mark has come and gone already. I feel like I've know I've been pregnant since forever but at the same time it's gone really fast. The belly is definitely popping. More so at night than first thing in the morning. It's amazing how fast our bodies change and the miracle that God creates for us to bare. It has been a bit of an adventure to get here and I'm diving into to it below. Weeks 1-7 were easy sailing. I felt fine with no changes to record. While I knew I was pregnant from week 3 on, nothing much changed for me on the day to day. Then trouble struck. When week 8 hit it felt like I was hit by a mack truck. I got morning sickness but let's be real, the term morning sickness is the dumbest name ever. It's never limited to the morning! It would be better named all day, feel like death, can't function and must consume copious amounts of tasteless food sickness. I couldn't function and was beyond worthless for about 80% of each day from week 8 until 16 weeks. Yup, a full 10 weeks. With my first I was never sick and had the easiest pregnancy ever. With my second I definitely was sick but for less time. The sickness came on around 7/8 weeks and ended by 14 weeks. The nausea was on a whole other level. NO food sounded good and I mean NO food. But not eating was my worst enemy. I needed to eat every 1.5-2 hours if I had any hope of fending off the impending nausea but when you’re not hungry and nothing sounds appealing the last thing you want to do is eat. For 8 weeks I felt lethargic, tired, ill and just plain yucky. No working out, no social fun, I was often scrapping up what little energy I had to make it through some days at the restaurant and then found myself laying on the couch much of the day and night. Kev stepped up big time. He handled the boys full time from the minute he got home and did the vast majority of any cooking or cleaning. Luckily by 16 weeks I got a little life back in me. I started feeling normal, got up the energy to start working out again (modified to say the least but moving none the less) and was able to participate again in the day to day. Throughout this pregnancy one thing has been consistent, my desire to eat avocados. I’ve eaten my weight in avocados. I’ve always been a salty over sweet kind of girl and that definitely hasn't changed this pregnancy. I opt for chips over dessert Every. Single. Time. Cheddar and sour cream, cool ranch or jalapeno are all at the top of the list and while I don’t normally buy chips and don’t even crave them enough to give in and buy, with summer and BBQ’s they often find themselves on the table and then I find myself with my hand in the bag. Other than that I haven’t really had any true craving thus far. My larger problem is having strong aversions to certain foods. I don’t really want to eat meat, especially chicken. I force myself because the protein is often needed but it really does not sound appealing 9/10 days. Now that I'm past the nausea stage it is getting better and I'm back to eating most all that I used to. Speaking of eating…thus far I’ve gained 8 pounds which is actually similar to my pregnancy with Colton. With Bronson I started in a less fit condition and was not as conscientious so I gained more early on. 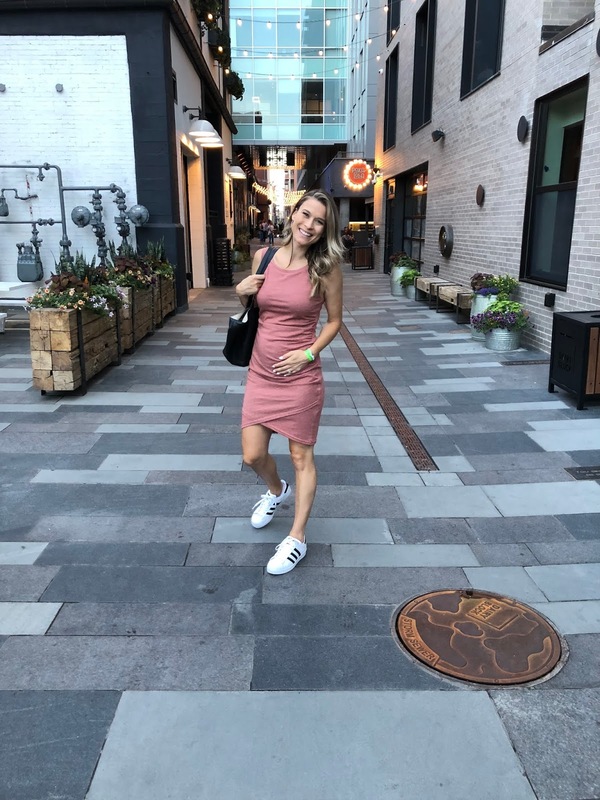 The fact that I was pretty active pre-pregnancy (high fitness) and the fact that I’m moving more in my day to day with the restaurant rather than when I was working as a lawyer and sitting all day definitely lends itself to the lower weight gain. With both my other pregnancies I gained exactly 30lbs. I was completely comfortable with the gain since it was done in a healthy manner and did come back off (faster with C than with B) but I would be lying if I said I didn’t hope to gain a little less this time around. 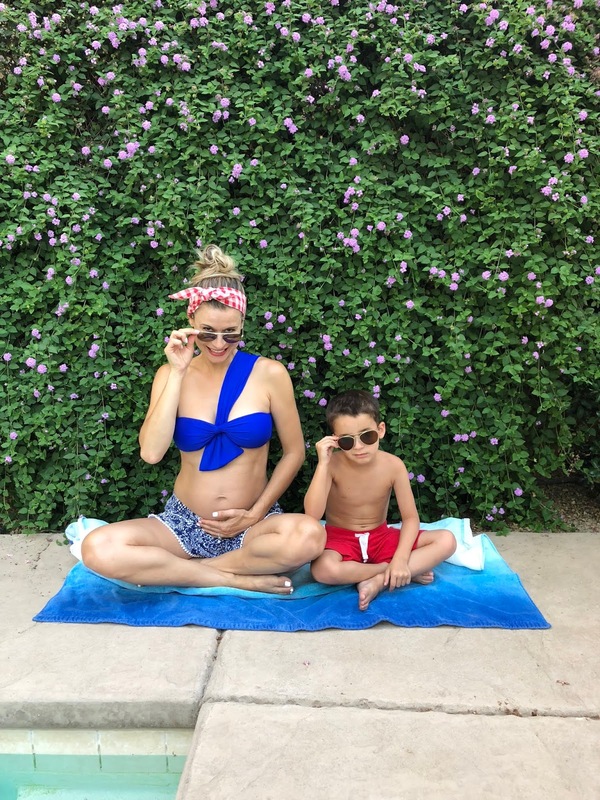 Being pregnant is beautiful but can be hard on the body and when you’re doing it for the third time, just a wee bit older, it seems all that much harder to get back to your normal. That being said, I never restrict myself. I order the burger with fries if I'm really craving it and often succumb to the 9pm bowl of cereal. I try to just be cognizant of how much and how often and I try to balance it with a walk or a healthier option the next time around. I know the time to worry about any weight gain is after baby girl comes and that's fine by me. Other than that I have most of the normal pregnancy ailments. My lower back gets pretty sore if I stand too long. I have a hard time getting comfy at night but I'm not complaining because I am still sleeping and pretty well at that. I don't have to pee often, yet. I'm lucky and am normally a camel so happy to see that's still in effect. My largest area of growth, besides the belly, is my chest. Sorry for the TMI but I've already grown a full cup and I'm inching ever closer to a second cup. I'm scared fro my my milk actually comes in! My energy levels are back up compared to the first trimester but when I do workout I have to take it easy. No real support for that belly so jumping around at HIGH Fitness is really out of the question. Lastly, I've recently started getting the bug to nest and am focusing on getting the boys adjusted to sharing a room so I can start redecorating the nursery. That's about it or at least all my mom brain will allow me to recall. I'll try to do another update when I start my third trimester but in the mean time, if there's anything you want to know don't hesitate to ask.